Based on a ground-breaking seminar for high school students, one of the first books to highlight the power of “What if”… to deliver the keys of design-based problem solving and strategic thinking to both children and adults…to bring the timeless wisdom of The Art of War into the grasp of both teachers and students of all ages…weaving a fable for children with concrete steps to overcoming life’s inevitable big challenges. What do we do when problems don’t want to be solved? 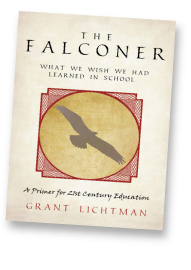 What does falconry have to do with learning?